Essendon is tantalisingly close to securing their finals berth following a 66-point win over North Ballarat at Eureka Stadium on Saturday. The Bombers kicked the opening five goals of the match and then did what they had to do, winning 15.10 (100) to the Roosters 3.16 (34). The Bombers were helped by North Ballarat’s inaccuracy, but were never challenged on the scoreboard leading by 45 points at half time. Essendon kicked with the advantage of the wind in the first quarter and got away to a flying start with Nick Kommer, Alex Boyse and Mason Redman kicking goals in the opening five minutes of play. Tom Wallis kicked a classy snap goal soon after and then Shaun McKernan marked strongly and played on immediately to goal from outside 50. Boyse kicked his second just before the first change, running back with the flight courageously and then going back to nail the set shot to open up a 34-point advantage. Kicking against the blustery wind didn’t bother the Bombers when they kicked the first two goals of the second term through Sam Michael and McKernan. The Roosters, who had their chances in front of goal, finally had their first through Keeble as the clock ticked into time-on. Some great run from Yestin Eades, Wallis, Shaun Edwards and Redman got the ball into McKernan who extended the Bombers lead at half time. There was certainly some tensions rising out on the field and the Roosters gave themselves some hope with Keeble’s second major. The third term was a dour one for the Bombers, until Shaun Edwards burst through the middle of the ground and found Boyse who broke away from a pack to kick his third of the game and the Bombers only goal of the quarter. With a 45-point lead at three quarter time, coach Matthew Egan demanded his side not give the Roosters a sniff and to kill off the contest in the opening 10 minutes. Aaron Heppell produced one of his trademark goal saving spoils with the Bombers moving it forward and Sam Michael benefitting from a 50 metre penalty to kick his second. A classy running goal from Edwards, starting at half back and getting it back at half forward was the highlight of the game with Boyse adding to his tally soon after. A long range goal from James Polkinghorne and then a Jason Ashby goal finished off the contest. Shaun Edwards highlighted his class and speed with an arguable best on ground performance with 26 disposals. Nash Holmes was instrumental in the win, relishing the blustery conditions and picking up 25 touches but missed opportunities in front of goal kicking four behinds. Aaron Heppell and Ben Dobson’s change to the midfield continued with 24 and 23 touches respectively with James Polkinghorne helping himself to 22. Shaun McKernan’s form continued with three goals while Alex Boyse, playing just his second game, provided a key target all day and finished with four majors. 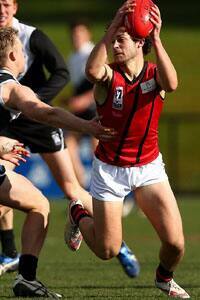 Assistant coach Paul Corrigan said that the Bombers carried their good form from last week’s win. “We were kicking with the breeze in that first quarter but we came out firing, we were really good around the contest early and got the ball moving forward,” Corrigan said. “We had some good match ups and six forwards working together, the team care and communication we spoke about before the game came into it and we got on the board early with five early goals. “We knew at quarter time that North Ballarat would get a rev up and try and change the way they played in the second quarter. Corrigan said the coaches reiterated the pregame messaging at the half time and told the players not to get carried away with the opening two quarters. The Bombers have changed it up in the last couple of weeks and are getting even contributions from a lot of the players. “When we play good footy through all the lines means that when you get to the end of the game you are trying to pick the best players, it’s really hard because you’ve got a lot of people you could put in there,” Corrigan said. “It’s a different mix through the midfield with Shaun Edwards and Nash Holmes playing predominantly on the wing today and they found a lot of ball on the outside as well. “Jason Ashby, Will Hams, Aaron Heppell, Ben Dobson and Polkinghorne going through the midfield it gives you a good blend of guys who are strong inside and then can spread out of the contest. In other results, Collingwood all but ended Box Hill’s finals hopes on Saturday while Essendon’s place in the finals will be assured if Sandringham can beat Richmond on Sunday.